Fuji's FinePix Z700EXR is incredibly stylish and powerful digicam. Featuring a 3.5-inch Touch LCD, 5x optical zoom lens, sensor-shift image stabilization and 720p video capture, its loaded with useful features. These features are matched by its great image quality and performance.Read more in our Full Conclusion. Fujifilm's FinePix Z700EXR is a powerful and innovative new digicam that combines a their Super CCD EXR sensor with their high quality Fujinon 5x optical zoom lens for capturing superior 12-Megapixel images. For framing and viewing your images Fuji has added a 3.5-inch touch screen display with a graphical interface that changes with the orientation of the camera, the same way that a touch screen cell phone changes. They have also added Auto Dog / Cat detection to compliment its Face Detection and Recognition. All of these features and more have crammed into this ultra-compact digicam. Fuji's new Super CCD EXR image sensor uses larger pixels placed closer together, as well as a new color arrangement, making the camera capable of increased image size with increased sensitivity. This allows the camera to operate in 3 different modes: High Resolution, Wide Dynamic Range and High Sensitivity. The new EXR Auto combines the camera's auto scene recognition with the cameras ability to automatically change the CCD mode for the particular scene. 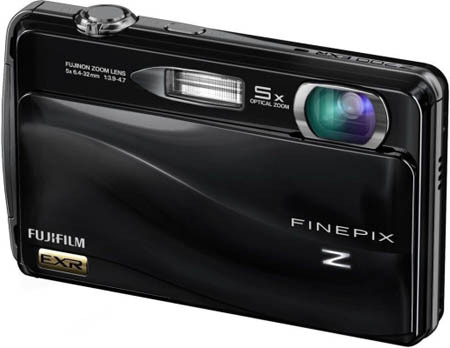 The Fijifilm FinePix Z700EXR is available now with a MSRP of US $279.95.